We’d love your help. Let us know what’s wrong with this preview of Miss Zukas and the Island Murders by Jo Dereske. The ever-conscientious Miss Helma Zukas of Bellehaven, Washington, is not one to renege on a promise—even one made hastily . . . and too long ago to possibly remember! So when an anonymous note in the morning mail reminds her of her vow to bring her high school classmates together for a twenty-year reunion, Miss Zukas hops to and begins organizing the perfect celebration . The ever-conscientious Miss Helma Zukas of Bellehaven, Washington, is not one to renege on a promise—even one made hastily . . . and too long ago to possibly remember! So when an anonymous note in the morning mail reminds her of her vow to bring her high school classmates together for a twenty-year reunion, Miss Zukas hops to and begins organizing the perfect celebration . . . despite some vague and mysterious warnings about dire consequences. 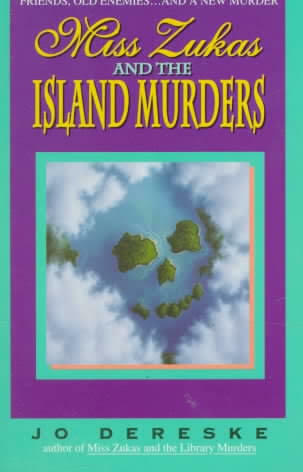 To ask other readers questions about Miss Zukas and the Island Murders, please sign up. When I read the first Miss Zukas mystery, I enjoyed the way that the author revealed the personality of the heroine. It was an excellent example of showing instead of telling the reader. And what did she show? A fastidious librarian, very conservative in her tastes and actions. Helma (don't call her "Helm") Zukas likes things to be just so. That is why I pictured Miss Zukas as my elder, someone with many years on me. Imagine my shock when I realized that Helma is my contemporary. This dawned on When I read the first Miss Zukas mystery, I enjoyed the way that the author revealed the personality of the heroine. It was an excellent example of showing instead of telling the reader. And what did she show? A fastidious librarian, very conservative in her tastes and actions. Helma (don't call her "Helm") Zukas likes things to be just so. That is why I pictured Miss Zukas as my elder, someone with many years on me. Imagine my shock when I realized that Helma is my contemporary. This dawned on me in the second book where Miss Zukas is helping to plan her 20th high school reunion. Wait, what? My 20th reunion will be next year. This confusion over the heroine's age isn't the author's fault; in fact, it isn't a fault at all. She was explicit in stating that Miss Zukas joined the staff at the public library in Bellehaven, Washington right after earning her library degree. In her "show don't tell" style, Dereske makes clear that Miss Zukas fits in with the other elderly residents at the apartment complex she moved into 15 years prior, but she is not the same age. Instead, she behaves as a stereotypical prim and proper librarian making her feel older than she really is. I read three of this series in quick succession, and by the third I was warming up to the character, but, really, I could not identify with somebody who could, even in private, utter only "Faulkner" as her most heated swear word. It's been a long time since I read a Miss Zukas mystery, and I enjoyed getting plugged back in. It was a light read, but with some interesting (and smart, some of them) twists and turns. And of course, I liked the library connections. I look forward to reading more in the series. This was a fast read thriller, with well drawn characters and a beautifully evocative setting. #2 Helma Zukas mystery, featuring the intrepid librarian who lives in fictional Bellehaven, WA. Helma gets an anonymous letter reminding her that she promised to plan her 20-year high school reunion, and also hints that the death of a classmate after a basketball game their senior year may not have been an accident as was previously believed. Since Helma was the class treasurer and invested their funds with her usual aplomb, she and her friend Ruth who also hails from back home, decide to invite #2 Helma Zukas mystery, featuring the intrepid librarian who lives in fictional Bellehaven, WA. Helma gets an anonymous letter reminding her that she promised to plan her 20-year high school reunion, and also hints that the death of a classmate after a basketball game their senior year may not have been an accident as was previously believed. Since Helma was the class treasurer and invested their funds with her usual aplomb, she and her friend Ruth who also hails from back home, decide to invite the whole class from Scoop River, MI (all fifty-two of them) to come to Bellehaven to spend a weekend at a resort in the San Juan Islands. Only half of them end up coming, and it's clear that someone is out to sabotage not only the reunion, but also possibly Helma and other members of the class who may know something about the classmate's death. My only caveat for this book: we have a group of 23 adults who still really care about the romance and rivalries of their high school years. Seriously? Who, in their late thirties, can still summon up fury and indignation at the girl (now a woman) who 'stole' your crush 20 years ago? Shouldn't we all have grown up just a smidge? That aspect of the plot was irritating and just plain silly. I hadn't read a Miss Zukas book in ages and it's just as good as I remember. Helma Zukas is a very proper and straight-laced librarian in Washington State. As a fellow librarian, I reveled in their staff meetings described by their head librarian as "Harmony circles". Also, the following sign was a very good way to gauge when it's time to take your 15 minute break "WHEN A LIBRARIAN DELIGHTS IN GREETING THE PUBLIC WITH A 'NO', AWAY FROM THE REFERENCE DESK HE OR SHE MUST GO". I took this book as my I hadn't read a Miss Zukas book in ages and it's just as good as I remember. Helma Zukas is a very proper and straight-laced librarian in Washington State. As a fellow librarian, I reveled in their staff meetings described by their head librarian as "Harmony circles". Also, the following sign was a very good way to gauge when it's time to take your 15 minute break "WHEN A LIBRARIAN DELIGHTS IN GREETING THE PUBLIC WITH A 'NO', AWAY FROM THE REFERENCE DESK HE OR SHE MUST GO". I took this book as my vacation book and it fulfilled its travelling companionship excellently! I'm working my way through this series. It's a nice surprise when the second book is better than the first one. The way Helma Zukas' past is slowly revealed and her personality beyond her public persona are both fun to read. I read this one while on the road, so I'm not sure if I followed all the little subplots, but I did like how she tied past and present together for a good mystery. It's not deep, but it's fun. I really enjoyed the setting of a class reunion for this little mystery. I'm liking Miss Zukas and her pal Ruth, and the characters' past comes into play bringing the classmates in. I know I'm going to enjoy the whole series... with its subtle revelation of relationships, and the clueless geeky heroine. Helma Zukas, formerly of Scoop River, Michigan,and now a Northwest resident plans their 20th high school reunion in the San Juan Islands. Unsolved issues from high school crop up to make it a reunion to remember. Tightly written--keeps one interested in a small book. This series of books about librarian Helma Zukas is funny, funny, funny! I have read a number of them and enjoyed all of them. Helma gets into trouble while arranging her high school reunion in this one. A cute & cuddly "cozy" mystery, starring a librarian whose sense of and desire for order leads her into solving murders, as well as organizing her high school reunion. Set in the Puget Sound area, this dryly humorous series is extra fun for locals. Miss Zukas is an impossible character but that's why we love mystery fiction: impossible creatures like Poirot inhabit that world and we can pretend such beings could exist in our world, though, one would hope, our world would have less people being bumped off for spurious reasons. I love Miss Zukas and her precise, prissy, persnickety self. Imagining Helma as a high school student was interesting. I missed this book when reading further in the series, and am happy to have caught up with her. The mystery part was OK, if simplistic. I'd expect someone as exacting as Miss Zukas to know when to use "who" vs. "whom", even if the author & editors do not. Class reunion on foggy island? Murder, mystery, and mayhem? Let's go! Lot's of fun. Good pool-side read. I just love Helma Zukas! I was laughing just a few pages into Chapter 1 when Miss Zukas is rearranging her fiction books into alphabetical order from Library of Congress order. Always a good read when Librarians have to solve murders. Passed on to me from Mom. It was better than the previous Miss Zukas mystery. But still an overload of details. Some breaks from character. I like the characters. the one thing that I hate that is the earlier books are so hard to find. Miss Zukas remains one of my favorite cozy mysteries. This is the second in the series. I thought I'd read the first, but I haven't ... ooops!!! Oh well, I'll read that next, but out of order bothers me!!! I grew up in rural Michigan, greatly influenced by my Lithuanian roots. I'm one of those tedious people who wanted to write stories as soon as I learned to read, but believed I had to leave Michigan first. In fact, I couldn't wait to shake off that Michigan dust! Curiously, everything I write seems to have a connection to Michigan or my Lithuanian heritage. I now live in the beautiful foothills of Mount Baker, near Bellingham, Washington. I've loved being a librarian: libraries are one of our last truly public institutions, where the whole world, in all its zits and glory, passes through. There are twelve titles in the Miss Zukas mystery series. Miss Zukas is tough, honest, crafty, a complicated woman with a deep but futile desire to perceive the world in black and white. And yes, Helma Zukas is what used to be called, a “real” librarian. You might say she embraces the stereotype. Helma is unapologetic. Ruby Crane is a forgery specialist, a subject that's fascinated me since I forged my first absence excuse in fourth grade. There are three books in the series. My three young people's books were written when my children were young. Please visit me on my website!